Pharrell Williams can clearly be seen wearing the Apple Watch on the popular TV show 'The Voice" one of the lucky few to get his hands on the Apple Watch. Likewise, Apple CEO Tim Cook is attending the NCCA national championship game with the Apple Watch clearly strapped on his wrist. 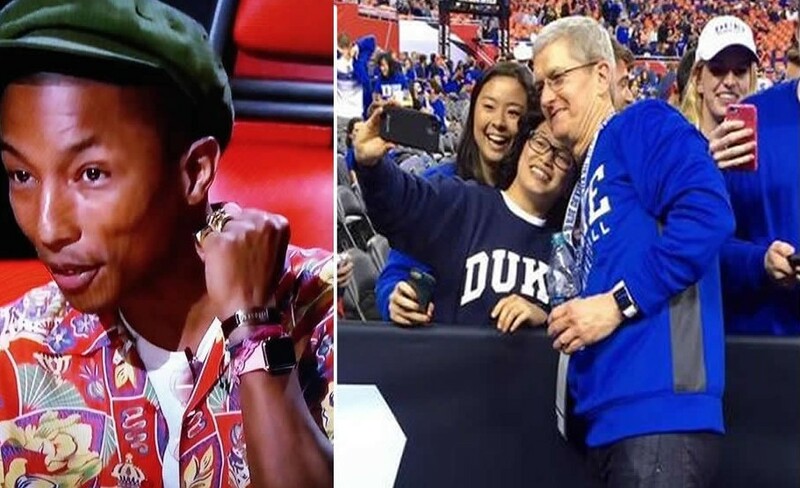 Tim Cook appears to be wearing the stainless steel Apple Watch with a white sport band, while Pharrell appears to have on the 18-karat rose gold “Edition” model with white sport band, which retails for $10,000, marking the first time a non-Apple employee has worn it on national television. The Apple Watch will go up for pre-order on April 10th, with in-store previews beginning the same day. The device will go on-sale April 24th, although we've noted that retail stock will be incredibly limited for many models on launch day. Tim Cook sent a memo to all Apple employees regarding the Apple Watch launch. In the memo, Cook congratulated his staff on the hard work it has put towards the Apple Watch. He also noted that Apple employees will all get 50% discounts on the aluminum sport and stainless steel models of the Watch and $550 off of the gold Edition variations.